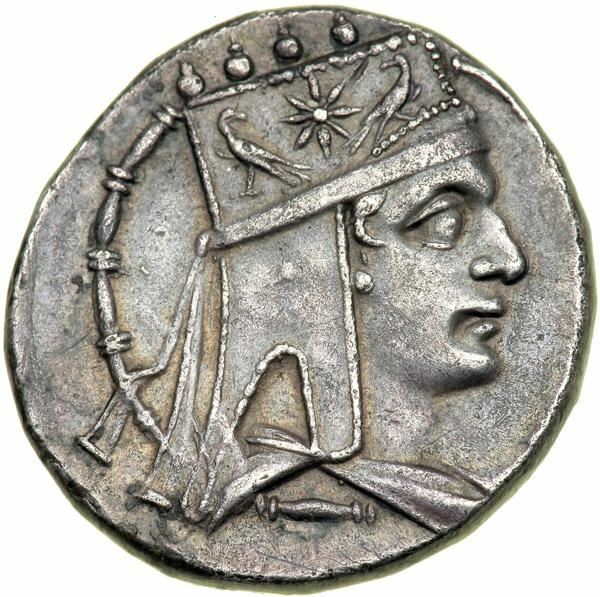 Tigranes II - usually known as 'the Great' - was King of Armenia under whom the country became, for a short time, the strongest state to Rome's east. He was a member of the Artaxiad Royal House. Under his reign, the Armenian kingdom expanded beyond its traditional boundaries, allowing Tigranes to claim the title Great King, and involving Armenia in many battles against opponents such as the Parthian and Seleucid empires, and the Roman Republic. In 66 BC, Pompeius Magnus advanced into Armenia with the younger Tigranes, and Tigranes the Great, now almost 75 years old, surrendered. Pompey treated him generously and allowed him to retain his kingdom in return for 6,000 talents/180 tonnes of silver. His unfaithful son was sent back to Rome as a prisoner. Tigranes continued to rule Armenia as an ally of Rome until his death in 54 at age 85.